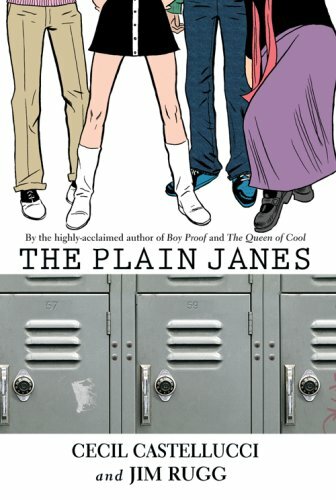 Want to win a copy of The Plain Janes? Enter my contest here. After a terrorist attack strikes Metro City, Jane's parents move her to suburbia. No museums and a whole new school. She knows the drill and just wants to find some like-minded kids. She finds a table that seems perfect at lunch, surprisingly filled with Janes. 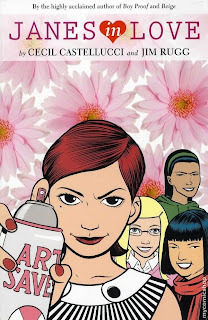 The Janes decide to start up P.L.A.I.N., People Loving Art In Neighborhoods, and decorate the town in beauty. There's love and mystery and covert missions. High school kids trying to make the world see beauty instead of fear. This was an interesting post 9/11 tale. I love street art when it's classy and not just someone's name crappily spray-painted on something. Loved seeing all the different art projects that the Janes got up to. Damon, oh Damon you silly fool. He was a fun character and one of my favorite scenes involves him and Jane. Officer Sanchez reminds me of Farva from Super Troopers. The way he looks and acts just cracks me up. 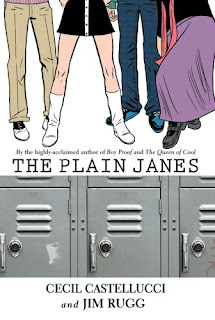 Each of the Janes are fun and quirky and different. I loved how different they were, but still were held together by a common thread. This is one of my favorite Minx books and I recommend it highly to girls who love graphic novels. "Metro City. Last spring. When it happened, I fell. There was a pop and then nothing. I didn't know what was happening." "Maybe, just maybe, art does save." The Janes are back at it. A bust at New Year's won't hold them back. They know that art saves, and their town needs saving. Of course, their hearts need saving too. They are all pining away for someone. Officer Sanchez is none to pleased about having more art "vandals"on the loose. When the Janes get shaken up though they know they have to change their approach. Maybe if they can get a grant the town will see them as "real" artists and start to appreciate the beauty all around them. This was another fun adventure with Jane and Jayne and Polly Jane and Jane. :D Even more art projects to try to help a world that is bowing under the pressure of terrorism. It can be hard to see the world as a beautiful place if all you can feel is fear. Emotions ran high in this one. Love was in the air, but there was also a lot of heated exchanges. This was a really excellent sequel and oh how I wish that there would be another Jane book. I would love to start a huge art program like this. Oh, to be in high school again. Anyways, loved this book too and definitely, definitely check out this series soon. "I can't believe that it's been nearly a year since it happened." "Hello. How wonderful to be able to say these words to you. Hello, dear Jane. Light of my life."